From a women's rights perspective, we have come a long way over the years, although there is still much more progress to be made. Imagine if you will, though, a world where all that has been fought for is taken away in the blink of an eye. Women can't work. Women can't have their own bank accounts. Women's thoughts and opinions are not to be trusted or taken seriously. Women have no choice in their form of dress. Women have no say in who with, when, or if they have children. That's the world that Margaret Atwood paints in The Handmaid's Tale. It takes place in a society where the population is plummeting, religious sects are at war with one another, and women primarily serve one of three roles: a Wife, the spouse of soldiers and government leaders; a Martha, or what we would refer to as a housemaid; or a Handmaid, whose sole purpose is to increase the population by providing the government's leadership/Commanders with children. The Handmaid's Tale is narrated by Offred (handmaids lose their names, too, and take on that of their Commander). Before the existing government took power, Offred had a husband and a child, both of which have been lost to her. The story centers around Offred's time with her Commander and his wife, her desire to find her family once again, and her involvement in the rebellion alongside fellow Handmaid Ofglen. The location, time-wise, of the story changes frequently; Offred will be discussing a thing of the present, then the scene will flash, without warning, to an event in the past that usually concerns her Handmaid training or her former family life. At first, this back and forth was difficult to follow, but I then realized that this is how the mind generally works - we will be focused on something in the present, then our thoughts bolt to something that has long since happened. In this fictional, scary world of The Handmaid's Tale, these flashbacks bring a sense of reality, of normalcy. The flashbacks give us a mental break and show us something to which we as the reader can likely relate. They also serve as a frightening reminder that awful things can happen to regular people living normal lives; an everyday person can have their life turned upside down and irrevocably changed in an instant, through no fault of their own. It's a troubling thought. As a woman, The Handmaid's Tale was difficult for me to read. I have many of the things that Offred was stripped of - a family, a career, and the general freedom to live as I like. To imagine living in a world where these things are taken away was unsettling. Reading the book brought perspective, and it reminded me to stay thankful for all that I have - as many in the world are sadly not as fortunate. 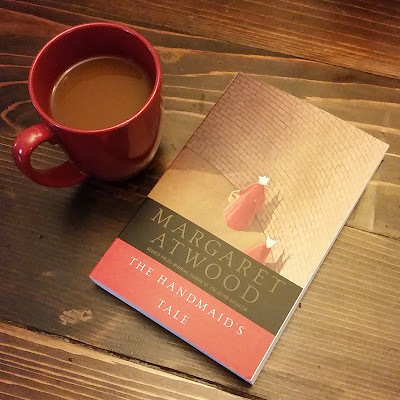 However, the (SPOILER) ending of the book, in its ambiguity, leaves the reader with either a sense of dread or a feeling of hope - it is up to us to determine Offred's fate, and I like to play the optimist and imagine that she gets a second chance at life and helps to repair the broken world around her. What do you think? I had been wanting to read The Handmaid's Tale for a long time, and I am glad that I took the opportunity to finally do so. Although it was mentally and emotionally challenging to get through, I do not regret that I dedicated a weekend to immersing myself in the story. On a lighter note, this was also the first book I'd read since the spring. Thanks, Margaret Atwood, for helping me get my reading groove back once again! Have you read The Handmaid's Tale, Hipsters? What did you think of it? Comment below!